The Big Green Egg ceramic kamado is a BBQ smoker, grill, pizza oven and even a tandoor all in one and brand aside I'm a big fan of ceramic grills. In fact the ceramic kamado has to be one of the most versatile pieces of outdoor cooking equipment that I’ve ever experienced. 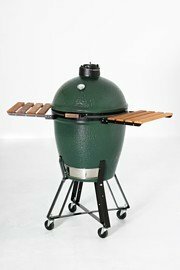 ★★★☆☆ - The Big Green Egg (BGE) is the original American kamado although it is now made in Mexico. Anyway, it might be the original, but sadly it's no longer the best. To demonstrate the comparison I've produced a table that compares value for money Big Green Egg vs Kamado Joe vs Monolith. Having cooked on pretty much every top brand ceramic grill over the last 10 years my review will highlight both good and not so good features and how the BGE features compare to Monolith, Kamado Joe and the Primo round kamado. 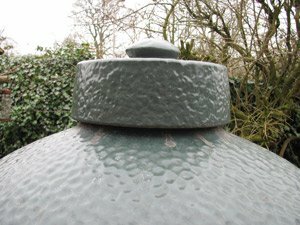 Manufactured from high quality ceramics which act as an excellent thermal insulant, a kamado will hold temperature constant for a long period of time. Temperature regulation is done by controlling the air flow through the grill, it has adjustable dampers both top and bottom and the more air that is sucked in the bottom, the hotter the fire gets and the hotter the fire gets, the more air that's sucked in. With top and bottom dampers fully open during ignition they say that your "Egg" will be up above 110°C (220°F) in 10 minutes. Having used one for a few years I'd say that it's more like 15 minutes but that's still streets ahead of either a traditional open charcoal grill and similar to a gas grill. The maximum temperature achievable is in excess of 375°C (700°F) which is ideal for pizza or a nice piece of tandoori chicken. I have a Big Green Egg at home, I also have 2 Monoliths and recently sold my (Primo) oval (because the oval shape means I can't use any of the increasingly abundant range of accessories for round ceramic grills). The BGE was first kamado I ever bought mainly because in the UK in 2008 it was the only kamado available and even then I had to buy it from a company in the Republic Of Ireland. I have to say that it does more or less everything that the marketing blurb states, and let's face it, it really is marketed well, but then again so do most other top brands of kamado... and I believe that both Kamado Joe and Monolith have now surpassed it. XL Egg - 24 inch cooking diameter weighs 93Kg / 205lbs and offers 1" more cooking diameter than the Monolith LeChef or Kamado Joe Big Joe. The versatility of cooking styles that can be done on the ceramic barbecue is one of it's key selling points. The critical piece of kit that every ceramic grill should include is the ceramic heat deflector stone (BGE call it the plate setter) that sits under the cooking grate so protecting your food from direct heat. In essence by inserting the "plate setter" that you can cook indirectly and use it as a smoker or oven. Monolith and Kamado Joe both include the heat deflector stones in the basic package, the BGE & Primo kamado do not so you need to be aware of this when it comes to making price comparisons. In addition both Monolith & Kamado Joe also feature a split heat deflector stone in their Classic and larger models so that you can grill and bake at the same time (or use for 2 zone cooking). 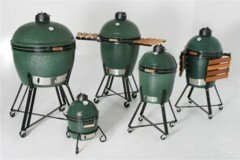 Both Big Green Egg and Primo kamado have failed to make this innovation although it is available at extra cost in the Primo oval - see my comparision of the Big Green Egg versus Primo oval. A nice touch that is unique to the BGE is the ceramic snuffer cap that you can place over the top when your grill is not in use. This works not only to protect your top damper from seizing, it also acts as a great cork when you want to cut the fire at the end of the cookout. The bottom damper also has a secondary perforated cover to protect you from hot ash during the cookout. A nice safety feature. TIP - When you remove the top damper at the end of a cookout always leave it in the open position. After a few cookouts it will get tar in it that can "clog it up", it comes loose again when it warms up and it is so much easier to warm everything up when the dampers are open. TIP - When placing the damper on the top it's tempting to place it so that the embossed Big Green Egg mark is neatly facing you but won't help when cooking. When you turn your food, if the damper is positioned as I've described then it will slide into the fully open position when you open the lid so when you close the lid your fire and temperature will race ahead and (unless you notice) present you with a burnt offering. Place the damper on top with the hinge immediately in front of you and it won't lose its aperture setting when the lid is opened. This is where the Big Green Egg comes unstuck and the aforementioned innovation by Monolith and Kamado Joe to split the heat deflector stones on their two larger grills is a case in point. 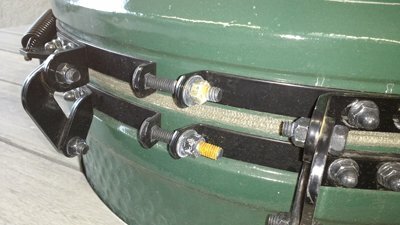 Kamado Joe (Joe II) have further innovated with a new hinge and "typically German" Monolith have innovated quality carts, buggies and their unique smoke chip feeder system that allows you to add wood pellets to your coals without getting a face full of smoke. It isn't so much "innovation" as "we've woken up and smelled the coffee" because I hear that 2018 will see the release of the split heat deflector stone and also a new rain cap. I've yet to hear whether these are standard or (as usual with Big Green Egg) options available at extra cost. As soon as I have more information I'll update my report. A new style hinge is the only significant innovation that I've seen on the current BGE over the one that I bought 10 years ago. This new hinge eases the weight of the lid by allowing the user share the lifting weight in both a vertical and lateral movement over the back of the base. It's a move away from the traditional hinge (still used by Monolith, the original Kamado Joe and Primo) to try and make ease the lifting of the lid whilst still allowing the full weight of the lid to provide the all important mechanical seal between the gaskets on the lid and the base. It achieved its purpose to some degree at the same time this new design feels somewhat less robust because the springs make a clunking noise as they expand and contract because of how they move as the lid is opened and closed. I have also heard some folks feedback that alignment of the lid and base during assembly is more difficult with this style of hinge. To be fair I've no experience on this point and you can avoid the risk by buying one fully assembled by your retailer. The other negative to this different hinge operation is that it eliminates your ability to guarantee being able to interchange different brand accessories on what effectively are common sizes of kamado. 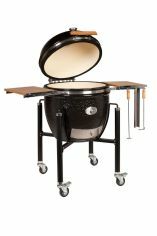 Here I'm thinking of the rotisseries offered by both Kamado Joe and Monolith and also the Monolith wok and stand. Note: The Kamado Joe II features and new hinge which is really easy to lift and lower, moreover if completely reverses the mechanism for creating the mechanical seal. Different it certainly is but will people pay the extra £350 and is it going to stand the test of time?... well I'd like to give it a few years wear and tear first. What's The Downside To A BGE? Worse still, this is a unit that I saw on display in a shop and the fixings are already starting to rust. 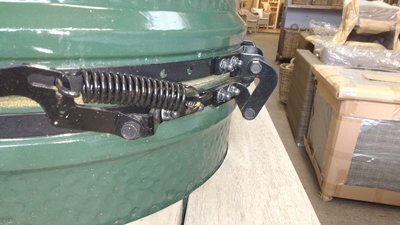 The Big Green Egg website states that the reason they persist with painted steel is because of the lower thermal expansion of mild steel versus stainless - their argument being that when you heat up a ceramic grill, stainless steel will expand more than mild steel and you risk the lid coming loose from the banding. 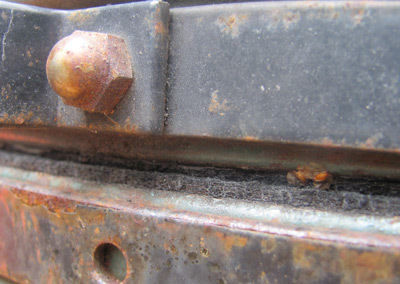 Note: Only Monolith offers rust free stainless steel hinge, banding and fixings as standard. 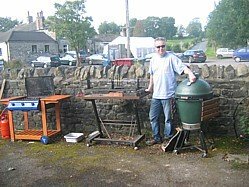 It's fair to say that both Kamado Joe and Monolith offer significantly more equipment in their basic bundles so in an effort to level the playing field I'll build up a Big Green Egg until it reaches the basic bundle from Kamado Joe and Monolith. So the table below will allow you to make an easy comparison Big Green Egg vs Kamado Joe, Big Green Egg vs Monolith and Kamado Joe versus Monolith. The Primo offering is different yet again but I've decided not to add a column for Primo because I think most folk buying a Primo will be want to buy the oval and this different shape deserves a more in depth feature comparison rather than just a straight forward cost comparison. There are some features that are specific to one brand such as the charcoal basket which is only available on the Monolith and Kamado Joe or the integral ash pan which is exclusive to Kamado Joe so I can't put a cost against these items so I've highlighted additional features at the bottom. One last point to make is that you won't see Big Green Egg or Monolith prices openly discounted on the web so the price I've used is the recommended retail price (RRP) but Kamado Joe publish a mythical RRP and the product is openly discounted. In order to draw a reasonable comparison I've used the discounted price that is most commonly used. The table above clearly demonstrates where value for money rests and there's still one thing that I haven't mentioned when comparing Big Green Egg vs Monolith vs Kamado Joe and that's the fact that both Monolith and Kamado Joe come boxed and delivered to your door as one complete unit - 30 minutes to build the cart and you're good to go... a Big Green Egg however will take you a good few hours because the lid and banding are supplied separately, they need to be fixed together and carefully aligned. I thoroughly enjoy cooking on ceramic grills, I’ve done my best ever tandoori chicken breast on the Green Egg, I’ve done a mean naan bread and wicked chicken tikka with the Monolith rotisserie and 7 skewer accessory. My point is that whichever ceramic you choose, you're going to get a fantastic piece of outdoor cooking equipment and you'll probably never want or need to buy another grill or smoker ever again. Kamado Joe vs Monolith = Monolith. The Monolith value bundle (saving nearly £300) is impossible to ignore and I love rust free stainless steel in our mild & wet British climate. If you still have your heart set on the green machine then you have to go through an official distributor and the best place to find this is on the Big Green Egg website but unfortunately this doesn’t always get a good search result. 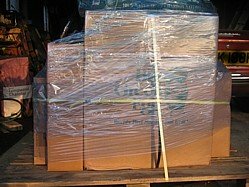 There are plenty of retailers in the UK and the UK distributor is Alfresco Concepts and these are the only UK guys selling direct on the internet. If you're in California you can buy a once used egg from the organizers of the SoCal Eggfest. Note that these units are sold as used, they therefore are discounted from the new price but it's collection only and no refunds. As a last resort you can e-mail Big Green Egg and they will come back to you. When you do find a retailer near you, most recognise that the product is premium priced compared to the competition and they will be willing to offer a discount. It's just that they won't publish it so you have to ask. 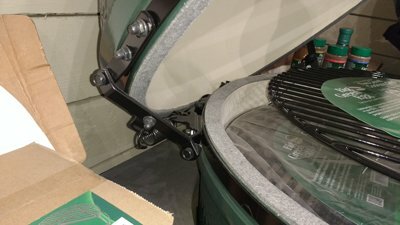 A final word of warning, if you find a new Green Egg being sold on the internet, the warranty will have been invalidated so if the price looks too good to be true, it probably is.